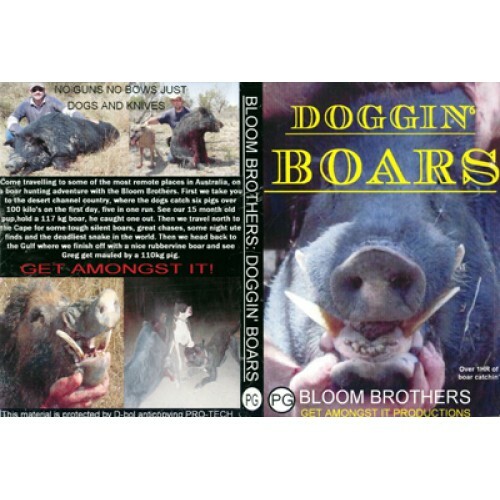 Bloom Brothers Doggin' Boars by Get Amongst It Productions. 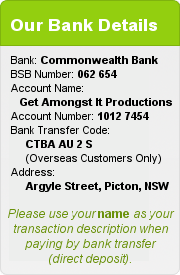 "No Guns No Bows Just Dogs and Knives"
Come travelling to some of the most remote places in Australia on a boar hunting adventure with the Bloom Brothers. First we take you to the deset channel country, where the dogs catch six pigs over 100 kilos on the first day, five in one run. See our 15 month old pup hold a 117 Kg boar he caught one out. Then we travel north to the Cape for some tough silent boars, great chases, some night ute finds and the deadliest snake in the world. Then we head back to the Gulf where we finish off with a nice Rubbervine Boar and see Greg get mauled by a 110 Kg pig.